This piece is cross-posted from the Stanford Social Innovation Review Blog. 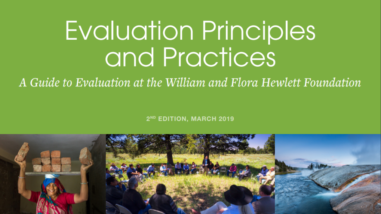 It is the first in a series of posts SSIR will publish on The Value of Strategic Planning and Evaluation curated by Paul Brest, emeritus professor at Stanford Law School, Stanford Center on Philanthropy and Civil Society faculty co-director, and former president of the Hewlett Foundation. -ed. I grew up in a deeply religious community. While the behavior of community members may have looked similar to an outsider, I found that there were, generally speaking, two kinds of people around me. I will call them the “certaintists” and the “meaning seekers.” The certaintists, as their name implies, had a great deal of certainty about their practice and beliefs, and often behaved as though they had a corner on the truth. They followed and enforced the rules of religious practice with little question, found comfort in routine and community, and were good, well-intentioned people. But their routines, I noticed, could occasionally inflict harm. Meanwhile, the meaning seekers followed the rules and established practices, but more as vehicles for finding spiritual meaning and leading a consciously just and purposeful life. What does this have to do with strategic philanthropy? Why am I impolitely introducing the usually taboo topic of religion into the secular world of philanthropy? Don’t we usually prefer to compare philanthropy to business? It is because during the last two decades of tremendous growth in philanthropy and the evolution of strategic philanthropy, I have noticed a trend that reminds me of the community of my childhood. Proponents of strategic philanthropy set out to help foundations have a greater impact on the problems we care about, and positive results of strategic philanthropy are many: The Robert Wood Johnson Foundation, for instance, has helped put obesity squarely on the map of problems facing the United States in a way that is spurring national attention for solutions. 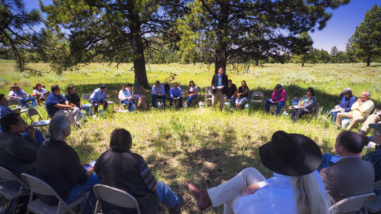 The Hewlett Foundation has made great strides in supporting the conservation of natural ecosystems of the West. The Edna McConnell Clark Foundation has led transformative efforts to help vulnerable youth by scaling proven programs. The Gill Foundation has been a major force behind the movement for marriage equality. The Gates Foundation has helped reduce incidence of malaria throughout Africa. And the list goes on. On the systems side, we have created and reinforced tools that make philanthropy more disciplined and focused on results. These include theories of change, which force us to articulate how we think change will happen and why. We can increasingly draw on evidence in those theories; and where evidence doesn’t exist, we can better describe our assumptions. Logic models, when we do them well, are tools that can unlock the black box of magical thinking and translate those theories of change into practical plans that address critical questions: Who do we think we will reach, through what means, in what timeframe, and with what results? We have also come a long way in the last couple of decades in our efforts to rigorously evaluate philanthropic and nonprofit initiatives. And finally, it is terrific to see an increased philanthropic focus on helping nonprofits develop into healthy, high-performing organizations. Smaller strategic foundations—such as the Haas, Jr. Fund, which has successfully developed nonprofit leadership—have advanced these capacity-building efforts. Yet along the way, strategic philanthropy seems to have evolved to a point where we have many certaintists and not enough meaning seekers. Certaintists come in many guises. There are those who want to quantify all problems and results to the point of absurd exercises in false precision. These exercises are often associated with an economic frame or an overlay of business jargon; just as often, they are treated as calculations that produce “the truth” rather than as a discipline to sharpen thinking and make more fully considered decisions. At the Hewlett Foundation, we have had many discussions about the merits of calculating expected return on various philanthropic initiatives, trying to not over-engineer the numbers but use the exercise as a way of teasing out our implicit assumptions. Equally certain are the many proponents of “emergent” strategy processes, who argue against the specification of expected results and the use of logic models and suggest calibrating as you go. Sometimes, of course, emergent strategy is exactly the right approach, especially for "complex" issues such as democracy building or at the beginning of initiatives where the way forward is not entirely clear. After all, social change is not a simple, linear process. But often the certaintists overgeneralize about the success and ease of implementation of emergence. For starters, emergent strategy means that you really need to be closer to the action, measuring, adjusting, and continuously seeking shared understanding and interpretation of facts on the ground with your partners. This can be expensive, time consuming, hard to do well, and especially challenging when working on global issues. As we have developed more strategic approaches in philanthropy, through logic models or blueprints for collective impact, we have also seen the rise of more rigid foundation practices. This has sometimes had an outsize effect on nonprofits that contort to meet trending funder requirements. I know program officers in large strategic foundations who worry about the frequency with which they ask grantees in other countries to develop strategies and business plans that align with the foundation’s strategies, but that may be out of line with an organization’s own capacity or mission. This has led to plans that looked beautiful on paper, but could not be implemented due to lack of capacity or expertise. There are those who take issue with the field of strategic philanthropy by critiquing the rules as overly bureaucratic, but the most vocal among them present their own brand of certainty. When we at the Hewlett Foundation recently invited Bill Schambra, the celebrated conservative commentator, to speak to our staff and challenge our way of doing things, he roundly criticized us and all of strategic philanthropy for being overly mechanistic, too metrics focused, and by implication, insufficiently trusting of nonprofits. But he showed no curiosity about how we actually work, and when our staff asked, in earnest, “What do you think we should do? If you were running a large foundation, how would you give the money away and make choices about what to fund and what not to fund? Can you advise us?” Schambra had no answer. He instead repeated platitudes we had already heard. He had his own rules and certainties, but was unable to translate them into meaning for us. The risk of certainty is that rules and processes can take on a life of their own, and we can then cease to seek meaning through their use. Harnessing the tools and systems we have smartly developed, such as theories of change and measurement techniques, and using them in ways that are less mechanical and more meaning-making serves us better. We can also expand our toolbox of approaches. We can be more flexible in our application of rules. Flexibility is a core asset of philanthropy—one that we do not want to squander. Even more importantly, we can be more open; we can proactively share how we work, what we have learned, where we have succeeded, and where we have failed so that all of us can learn from each other. We can also be more open to learning from others, including grantees, and especially from the ultimate intended beneficiaries of our work—so that we are more attuned to how people are experiencing the programs, products, services, and policies we support. We can learn from our intended beneficiaries via efforts like YouthTruth, designed to solicit the views of students about their schools, or Feedback Labs, a new global initiative designed to bring citizen voices into the conversation to make aid from government, nonprofits and foundations more productive and responsive. I am suggesting that we need to challenge the certainty creeping into our community, precisely because I believe philanthropy is sacred work that requires discipline and creativity in pursuit of meaningful results. Comments are closed on this post. If you would like to contribute to the discussion about it, please do so at SSIR. -ed.